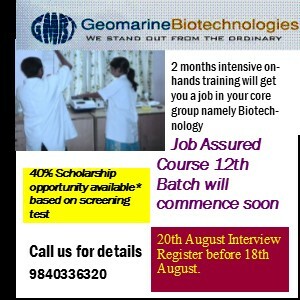 Look here for what is new at GeoMarine Biotechnologies as well as any programs organized. A few general things in this filed and other relevant news items from India and abroad also can be expected. Any announcements or recent photos during training or workshop photos can also be watched out. 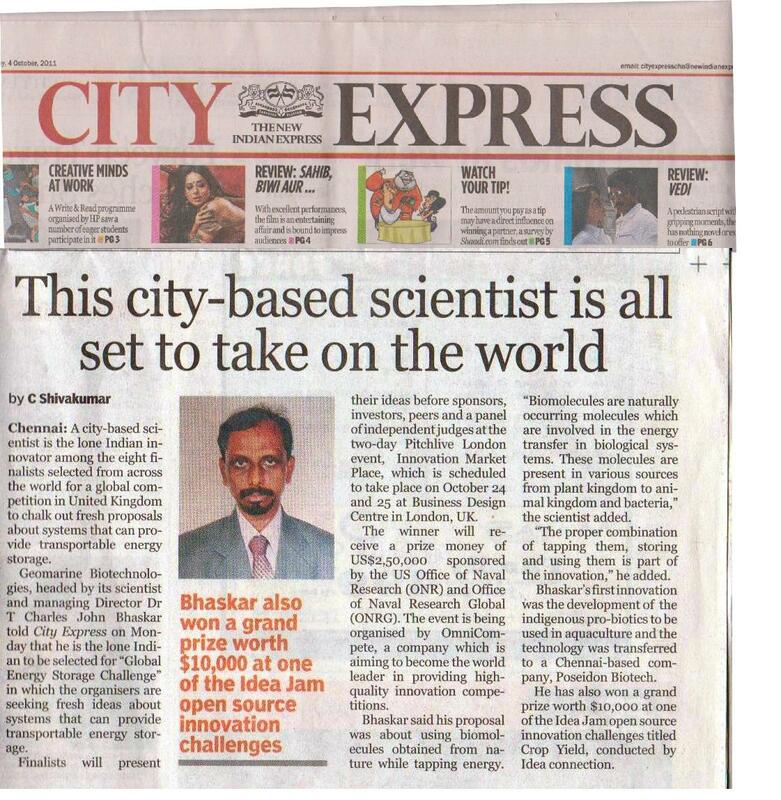 We are happy to announce that Geomarine Biotechnologies headed by Dr. T. Charles John Bhaskar has entered the Finals of "Global Energy Storage Challenge" conducted by Omnicompete. Geomarine Biotechnologies is one of the 7 finalists and will be competing for the Grand Prize of $ 250,000.00. Internship up to 6 months is available for college students. A new page From the Desk of MD is created. You can access it from the home page. The thoughts and vision of our MD is shared here. A few marketing positions are available for B.Tech / M.Tech / M.Sc., Biotechnology / Life Science students. Free one month training provided for this purpose. GeoMarine Biotechnolgies launchs a new website "www.indiainnovation.in" to help innovators and make innovation as business opportunity for India. Those looking for training in innovation, selling innovative ideas or innovation for their company can visit the site. Summer Training and projects were attended by about 80 students and they learnt skills including production of a few compounds and pharma products. Dr. Charles visited Kalinga Institute of Technology University for Campus interview during 29th and 30th June, 2014. Our Scientist & Managing Director was a Special Guest for the Investiture Ceremony at Maharishi Vidya Mandir Matriculation School, Irungattukkitai on 26th June, 2014. Our Managing Director was the Chief Guest to inaugurate Rose Buds Primary School, 17th May, 2014. Our Scientist was the Chief Guest at the Annual Day celebrations in Little Hearts Nursery & Primary School, Ambattur, Chennai on 10th April, 2014. About 95 students completed their Training / Project last summer. Last winter about 50 have got trained in various areas. Copyright � 1999 [GeoMarine Biotechnologies]. All rights reserved.